It is with great sorrow that we inform you of the unexpected death of Holt Murray on Saturday evening, November 15, 2008. A Memorial Service will be held on Saturday, December 13th beginning at 1:00 PM in the Erica Shilling Forum, Room 450, on the Cabrillo College main campus, Aptos, California. Link to a campus map here. In lieu of flowers, the family prefers donations to the Holt Murray Sculpture Scholarship fund c/o of the Cabrillo College Foundation, 6400 Soquel Drive, Aptos, CA 95003. If you wish to post a comment, email your thoughts to Marge at m.s.murray@charter.net and they will be posted on the adjoining page of Comments and Messages. Sorry, but the newspapers have changed some of these links which originally worked directly to the articles. You can download the Santa Cruz Sentinel obituary and two articles below. ÒHolt Murray.Ó San Jose Mercury News, November 29, 2008, Section B, p.7. and on line at the Mercury News. ÒHolt Murray.Ó Register-Pajaronian, November 29, 2008, p.3. "Holt Murray." Santa Cruz Sentinel, November 30, 2008. You can download a PDF of this obituary. Baine, Wallace. ÒHolt Murray's Life in Bronze.Ó Santa Cruz Sentinel, November 27, 2008, p. 3 and on line at santacruzsentinel.com or down load a PDF of this article. Baine, Wallace. ÒHolt Murray's Life in Bronze.Ó on line at San Jose Mercury News, Central Coast e-edition, November 27, 2008. Nakanishi, Rie. ÒHolt Murray, Sculptor and SJSU alumunus, dies at 76.Ó Spartan Daily, San Jose state University, December 10, 2008, Section: News. Down load a PDF of this article. 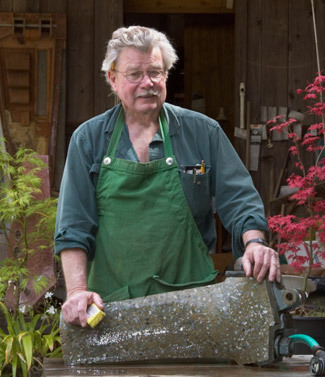 A newly published book, by Dave Hampton, documenting the 1960's Artist-Foundry movement in the South Bay area is now available. It contains information about Holt Murray and others who were pioneer artists in that movement. There will be some books available and the possibility of ordering books at Holt's Memorial. Anyone who wants the book, ÒPouring Metal in the South BayÓ can buy a copy online. Go to directly to the order page for it at www.blurb.com. They take Visa, Mastercard, American Express and Discover. It costs 21.50 plus tax (in CA) and shipping. More of Holt's sculpture may be seen on line at the Metamorphosis Art Gallery site. Dave Hampton, collector, at Objects USA site. Steve Daly, one of the participants in the Martha St Foundry Studio at Stephen Daly Studio site. Margaret Stanton Murray, fine art photographer, at margaret-stanton-murray.com site.